← What’s with Main Street? I thought I’d start out the new year by writing a simple story about Dr. W. A. Hendryx. After all, I’ve run into Dr. Hendryx quite a few times while reading old newspapers or rummaging through musty records in the county courthouse. I’ve never met him – he died in 1918 – but over the years his name has popped up in connection with a toll road, the original Kootenai townsite, and the Idaho Constitutional Convention. I’d also seen another name, R. E. Sproule, tied to the toll road but I’d never given him a second thought. When I looked into Dr. Hendryx a bit more, however, I found him connected to Sproule and before I knew what was happening, I was sucked into Sproule’s complex story that included contested mining claims and murder. Here’s a start on that story, with first a bit of background on Hendryx. Wilbur Alson Hendryx was born in Connecticut in 1849. Twenty-one years later he still lived at home with his parents and worked as a butcher. (Whether or not this job prepared him for a career in medicine is a matter of conjecture!) He received his medical degree from Rush Medical College in Chicago in 1874 and practiced medicine off and on for the rest of his life. 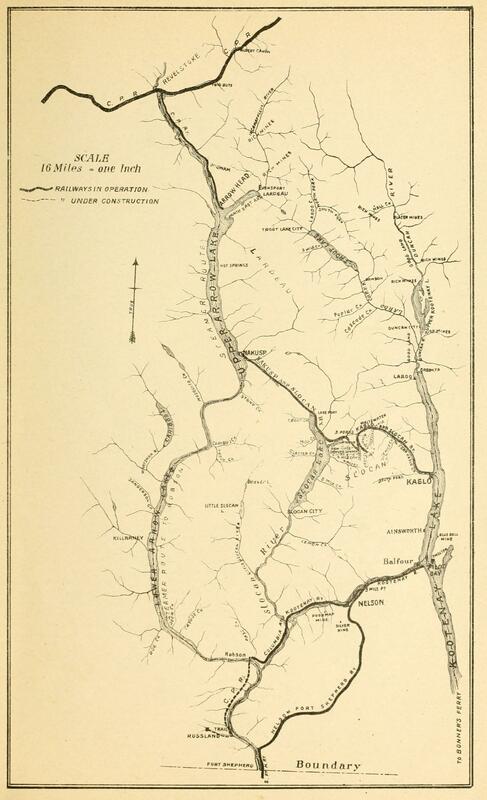 Map of Arrow and Kootenay Lakes, British Columbia, 1895. See below for credit. 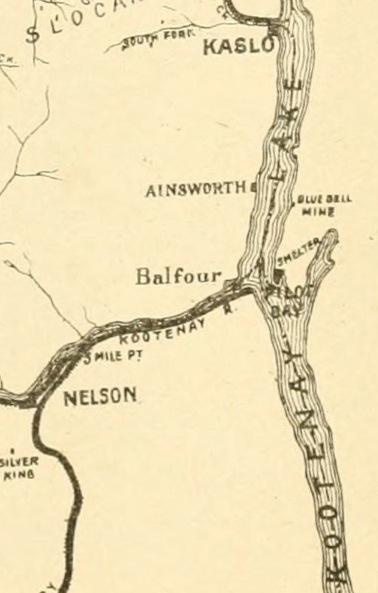 Portion of map showing Blue Bell Mine and the smelter at Pilot Bay. Sometime in 1884, Dr. Hendryx came to North Idaho where he met Robert Evan Sproule, the owner of an especially promising mining claim on the eastern shore of Kootenay Lake in British Columbia. Sproule had located the Blue Bell claim in the summer of 1881 and legally registered it with the proper authorities the following year. He was not alone in his search for promising minerals and soon ran into competition from three prospectors who were backed by a wealthy consortium. One of the men, Thomas Hammill, jumped Sproule’s claim after he left in October 1882. During a lengthy trial the following summer, Sproule and his associates prevailed only to have the case appealed to the Supreme Court of British Columbia. When the court ruled in the spring of 1884, Sproule once again won his claim to the Blue Bell and must have felt satisfied to hear Hammill condemned for his illegal claim jumping. Any satisfaction soon faded, however, when one of Sproule’s partners failed to pay the fines and court costs connected with other related litigation. The court took possession of the partner’s one-third share in the Blue Bell and auctioned it off that summer – to none other than Sproule’s nemesis, Thomas Hammill and his backers. Mr. Sproule was in a jam and knew that large amounts of money would be needed to develop the Blue Bell mine. His primary asset was his two-thirds share of the mining claim. Sproule also had acquired a franchise to build a toll road running between Mud Slough, on the northern shore of Lake Pend Oreille, and the Kootenai River near Bonners Ferry, Idaho. In the fall of 1884, Sproule and Hendryx reached some sort of agreement that gave Hendryx the franchise for the toll road along with a partial interest in the Blue Bell. While I was unable to find any records showing what Sproule got out of the deal, it is clear that Hendryx planned to develop the Blue Bell and thus greatly benefit Sproule financially. That same fall, Hendryx transferred the toll road franchise, along with his interests in the Blue Bell, Silver King, Black Hawk, and Surprise claims on Kootenay Lake, to the Kootenay Mining & Smelting Company. This new corporation was organized by Dr. Hendryx and other investors, including Andrew B. Hendryx, of New Haven, Connecticut. Andrew, Wilbur’s older brother, was part of the successful firm of Hendryx & Bartholomew, later changed to the Andrew B. Hendryx Co. His business manufactured a line of bird cages to house the small birds that were so popular during the Victorian era. 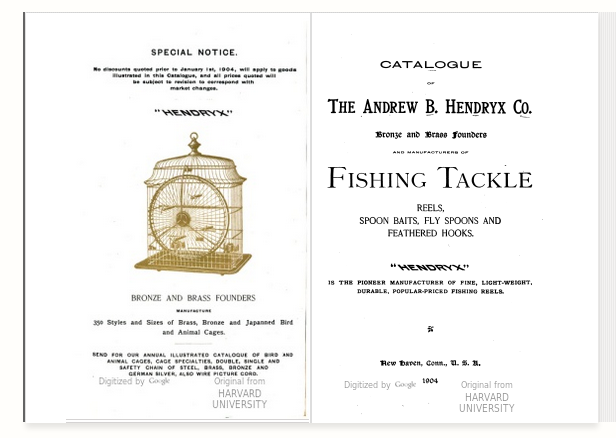 Products also included a number of models of fishing reels, with Andrew B. Hendryx holding many patents for their design. With such a successful business, Andrew likely provided much of the capital needed to fund the mining development on Kootenay Lake. As the new corporation was organizing in the winter of 1884-1885, Mr. Sproule was nursing a couple of grudges. Of course he disliked Thomas Hammill and his backers who, through unexpected circumstances, had ended up with part of the Blue Bell claim. Sproule also was angry with a man who had once been his friend and advocate. William A. Baillie-Grohman was a wealthy European gentleman who enjoyed both big game hunting and outdoor life. He traveled around the American West where he hunted and wrote prolifically about his experiences. He also was instrumental in some early development in the Kootenay region of British Columbia. Baillie-Grohman became acquainted with Mr. Sproule by early 1883 when he agreed to help with his original claim dispute. They stood together during the six-week trial at the mining camp and celebrated their win. When the cases were appealed to the Supreme Court of British Columbia, however, Baillie-Grohman had to return to England for business. After Sproule ultimately lost part of the Blue Bell claim, he blamed both Baillie-Grohman and Thomas Hammill and, according to one account, was heard making threats against both men. Sproule, hiding beside a trail near Sandpoint, took his first shot – literally – at Baillie-Grohman. Fortunately for his intended victim, Sproule missed when Baillie-Grohman’s horse shied at the sound of the rifle shot. The frightened horse and rider high-tailed it into town and took refuge in a shed behind the E. L. Weeks & Co. store. Baillie-Grohman considered Burt Weeks to be one of the few upstanding citizens in Sandpoint, describing the rest of the town as “one of the ‘tough’ towns in the tough territory of Idaho . . . .” Needless to say, Baillie-Grohman spent a restless night but managed to catch the morning train to Rathdrum where he planned to swear out a complaint against Sproule. His plans – and his life – were nearly cut short when his enemy jumped onto the train at the last minute. Before he could do anything, the unarmed Baillie-Grohman found himself with “the muzzle of Sprowle’s [sic] cocked -45 Colt, a big frontier six shooter . . . within 4m. of my forehead.” He was told to get off the train at Algoma, “a wretched siding, where the station shed was the only building, and the two railway officials the only inhabitants . . . .” Fortunately, as the train slowed to stop, the conductor arrived in their car and Sproule melted away. The two men never saw each other again. Thomas Hammill, however, was not as lucky. When he showed up at the disputed Blue Bell claim on June 1, 1885, Robert Sproule allegedly shot him in the abdomen. By the time Hammill died later that day, Sproule was on his way toward the border and safety in Idaho. He was captured just north of the border, however, and taken to Victoria where he was tried, convicted, and sentenced to die. He appealed his case to the Supreme Court but ultimately lost. He was hanged in Victoria on October 29, 1886, and buried in the jail yard. While Sproule’s sad case worked its way through the Canadian courts and made news on both sides of the border, the Kootenay Mining & Smelting Co., with Dr. Hendryx as its manager, set to work developing the Blue Bell mine. This project led to the establishment of the new town of Kootenai, east of Sandpoint on the Northern Pacific Railroad; the development of a wagon road connecting Kootenai to Bonners Ferry and the Kootenay mining region of British Columbia; and the eventual construction of a smelter at Pilot Bay on Kootenay Lake to process the galena ore.
After this diversion from my original topic, I’ll get back to Dr. Hendryx, early Kootenai, and the toll road soon. Ninth Census of the United States, Seymour, New Haven County, Connecticut, 1870, page 31; Directory of Deceased American Physicians, 1804-1929, accessed through Ancestry.com; D.M. Wilson, “East Shore of Kootenay Lake, B.C. : History,” 2001, revised 2010, http://www.crowsnest-highway.ca/cgi-bin/citypage.pl?city=east_shore#1, accessed 15 January 2016; Quit Claim Deed, Robert E. Sproule to W. A. Hendryx, 8 November 1884, Bonner County, Bills of Sale, Book 1:7; Declaration of Trust, Wilbur A. Hendryx to Kootenai [sic] Mining & Smelting Company, signed 8 October 1884 and recorded 6 December 1884, Bonner County, Bills of Sale, Book 1:6; “The Andrew B. Hendryx Company,” http://www.retropeacock.com/hendryx.html#.Vp_MbVJ0FaV, accessed 19 January 2016; “The Andrew B. Hendryx Company,” http://www.oldreels.com/hendryx.htm, accessed 19 January 2016; Linda Gross, “The Andrew B. Hendryx Company Knew Why Caged Birds Sing,” http://www.hagley.org/librarynews/andrew-b-hendryx-company-knew-why-caged-birds-sing, accessed 19 January 2016; “William Adolph Baillie Grohman,” https://en.wikipedia.org/wiki/William_Adolf_Baillie_Grohman, accessed 23 January 2016; W. A. Baillie-Grohman, Fifteen Years’ Sport and Life in the Hunting Grounds of Western American and British Columbia (London: Horace Cox, 1900), 231-251, quotations from p. 248; “Robert Evan Sproule,” Washington, Pierce County, Probate Case Files, Case 1080, Box 15, Vol. 1069-1088, 1855-1911, accessed on Ancestry.com, Washington, Wills and Probate Records, 1807-1997 (database online), Image 133-134, 136-137, 140-146, 158-160; “Sproule Must Die,” New York Times, 1 October 1886; “The Case of Sproule,” New York Times, 28 October 1886. This entry was posted in Uncategorized and tagged Andrew B. Hendryx, Blue Bell Mine, Bonner County history, Bonners Ferry Idaho, Kootenai Idaho history, Kootenay Lake British Columbia, Kootenay Mining & Smelting Co., mining Kootenay Lake, Robert E. Sproule, Sandpoint history, Thomas Hammill, W. A. Baillie-Grohman, W. A. Hendryx. Bookmark the permalink. Nice job Dr. R.! I can hardly wait for more of the story. Thanks, Dr. M! I have to keep busy somehow and this story was just too good to pass up.